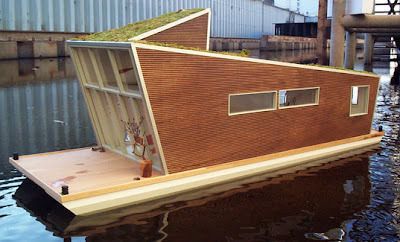 It has been a while since we've had an opportunity to showcase some Vegetated Architecture. You missed it, didn't you? Well, I did lose all of my accumulated links on my old computer - but it didn't take long to accumulate some more gems. And well, it's not all eye candy, as there has been some new ink about the state of rooftop greening. One tidbit was the significant cost escalation at the Vancouver Convention Center, which is dire news as the expansive 2.5 hectare roof is becoming more expensive as well. At least the payback should be immense with that much coverage. Here's some other more positive thoughts. Arch Daily starts off with a lovely addition - Sky Village in Rødovre by MVRDV. 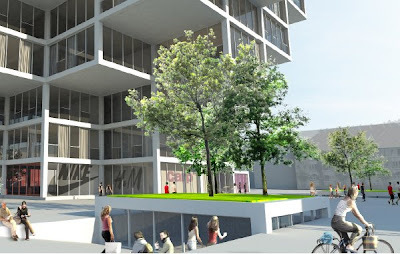 The terraced form fits nicely with the modular green roofs - although they seem a bit flat and perhaps surreal due to the oversized trees and lack of visible root zone. 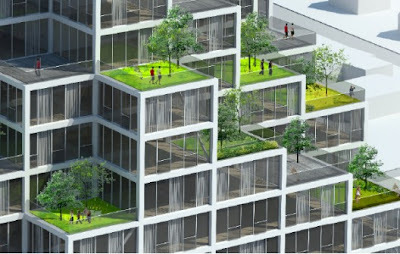 A cool effect, and interesting to see how the distributed spaces could be linked from roof to roof via gravity. A bit more restrained (and perhaps astroturfed? 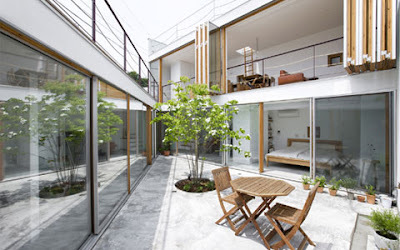 ), this example via Coolboom is the Garden House by Takeshi Hosaka Architects. A brief synopsis: "Although the indoor and outdoor are different environments, they are made from similar dimensions, structures, finishes and furniture. 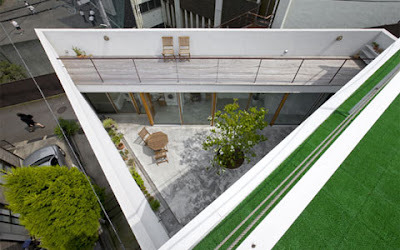 The whole house feels like a garden, where the living scenes expand to both indoor and outdoor." Cool... boom. 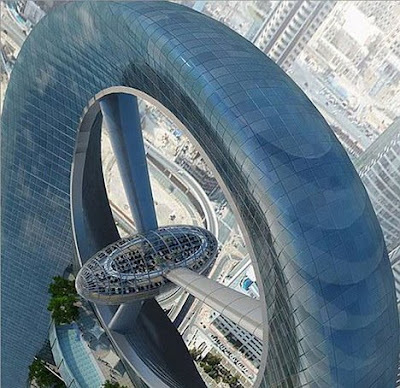 Veering from the water to the air, what looks like a giant fan, the (where else) Dubai Anara Tower, with "...sky gardens every 27 floors..." opening up to a large propeller turbine. 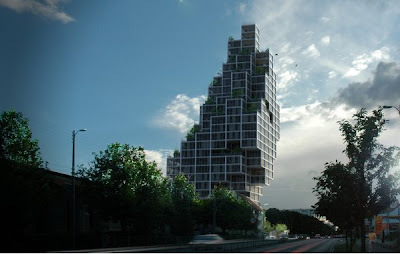 The design is based on a minaret, but somehow lacks the elegance of this simple form. 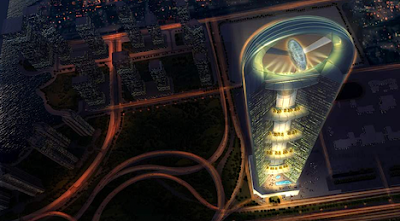 Also, check out JG's Preston and his commentary footnote about Dubai-chitecture... the bubble may be ready to burst. Lastly, this post stretches the idea a bit, but was a necessary antidote to the Dubai-n excess. 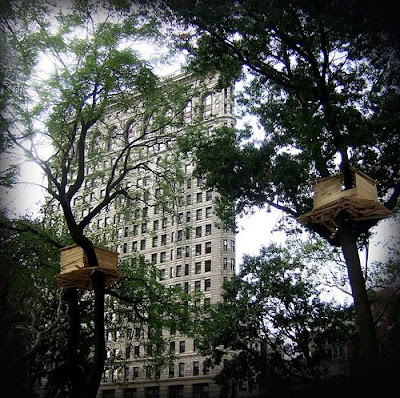 Via Archidose, these Tree Huts by Tadashi Kawamata are on view at NYCs Madison Square Park for the rest of the year. 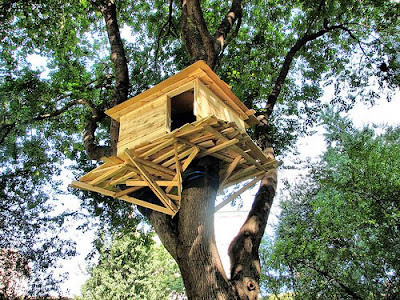 Simple rustic boxes reflect the somewhat ephemeral habitat located in the urban park - and allow the eye to catch these contrasting structures - perhaps missing the forest for the tree huts. I love yor blog. It's amazing!! !